Disney has done it again, with another great hit that tweens and teens will love. 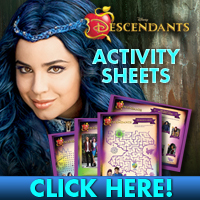 We had the opportunity to review Disney's Descendants and it was such a great movie. My daughter and I had already seen it live the night it came out on TV, so once we got the DVD we were excited to watch it again, plus watch the bonus features. The movie is about the teen kids of the most famous villians, Cruella de Vil, Maleficent the Evil Queen and Jafar. After the four villians were banished away to the Isle of the Lost for there evil doings by the King and Queen, Belle and The Beast, years later, their teenage son is about to have his coronation to become King and one of the things he wants to do is allow the kids from the four villains a chance to leave the Isle of the Lost they're stuck in and come to prep school where all the hero's kids attend. From beginning to end the movie has you dancing and singing along to the catchy songs. Not only was the songs and dances great, but as was the story line. The main thing we took from the movie was you don't always have to follow your parent's foot steps. Some times it's okay to go a different way, especially if it makes you happy. My daughter has been singing all the songs from the movie for days now and we can't wait til part two comes out! 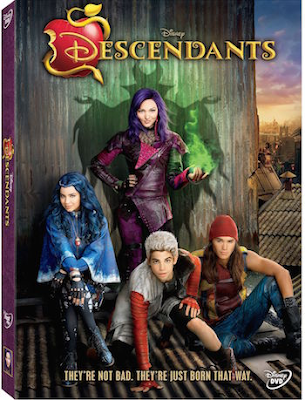 Disney's Descendants is now out on DVD in stores. Disclosure: All opinions are my own. I received Descendants on DVD at no cost for the purpose of this review. No other compensation was received.